Spyros Skouras’s dream of building a world-class movie palace in downtown St. Louis was grandly realized in 1926 when the $5.5 million Ambassador Theatre Building opened on prime real estate at the northwest corner of Locust and Seventh streets. The 17-story structure which housed the luxurious cinema also added an impressive tall office block to the city’s skyline. Less than two decades earlier the three Skouras brothers, Charles (1889–1954), George (1896–1964), and Spyros (1893–1971), had arrived in St. Louis from their native Skourohorion, Greece, the sons of a poor sheep herder. Living frugally on wages as busboys and bartenders in downtown hotels, the brothers pooled their savings of $3500 in 1914. In partnership with two other Greeks the Skourases constructed a modest nickelodeon at 1420 Market Street on the site of today’s Kiel Opera House. This initial property, named the Olympia, was quickly followed by the acquisition of other theaters. In 1920, the Skouras Brothers Co. incorporated with $400,000 of capital stock. More than thirty local theaters belonged to the Skouras empire by 1924. Five years later, the triumvirate sold out to Warner Brothers and moved east to claim top executive places in the industry. Charles eventually became president of Fox Coast West, and George, chairman of the board of United Artists. After Spyros helped merge Fox with 20th Century films in the 1930s he served as president from 1942 to 1962. During Spyros’s tenure there he worked to rescue the faltering movie industry from television’s lure. 20th Century Fox’s famous advertising slogan, “Movies are Better than Ever”, gained credibility in 1953 when Spyros introduced Cinemascope in the studio’s groundbreaking feature film The Robe. The Skourases chose Rapp & Rapp, Chicago’s famed theater architects, to design the 3000-seat Ambassador. The firm’s local debut, the St. Louis Theater (now Powell Symphony Hall), was completed in 1925 on Grand Avenue. In addition to Windy City achievements such as the Chicago, Southtown, and Uptown theaters, the brothers C. W. and George Rapp drew up plans in the 1920s for notable theater skyscraper hybrids that included New York City’s 29-story Paramount (1926); Cleveland’s 21-story Palace (1922); and the 22-story Oriental in Chicago whose top stories housed the Masonic Lodge halls. In the Ambassador, Rapp & Rapp expanded the firm’s typical Louis XIV Sun King style, a rendition of French Renaissance/Baroque motifs for which they were best known. The architects crowned the Ambassador with a distinctive cornice frieze of terra cotta griffins—a motif also displayed in two prominent New York skyscrapers of the period. Gazing across the rooftops, the griffins were well-placed as traditional guardians of treasure in antiquity. The planar quality of the cornice and flattened treatment of the griffins suggest the influence of modernist trends. The cornice marked a departure from older style, more elaborated cornices of high relief, often punctuated by lion heads. To announce the theater portion of the tall Ambassador Building, Rapp & Rapp designed a monumental arcade of giant windows along Locust Street, wrapping the corner of Seventh. Thirty feet high, these windows were richly embellished with finely detailed terra cotta in Renaissance style. Highly modeled theater masks of comedy and tragedy were featured on cartouche pier and spandrel panels. The three floors of theater offices fronting Seventh Street were appropriately distinguished by terra cotta spandrel panels featuring regal pairs of sphinxes, Egyptian symbols of power. 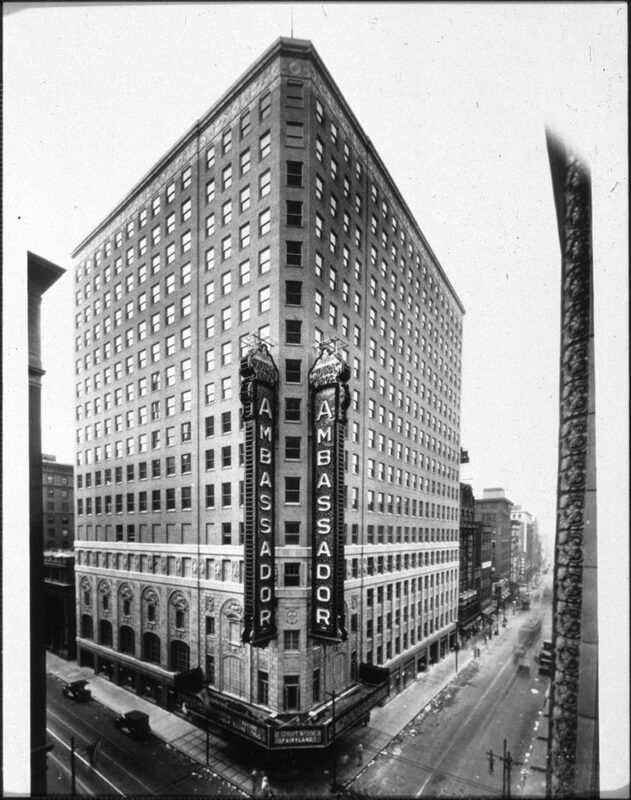 NBAC’s greatest recovery effort was the Ambassador Theatre office building. It involved removal of over 300 ft of terra cotta cornice and frieze from three elevations at the 18th floor. Hoisting, rigging, and working off of scaffolding at that height and dealing with what seemed to be an endless flow of 250 lb panels presented a unique logistical challenge. We then began the recovery of 78 terra cotta pier and spandrel assemblies from the third, fourth, and fifth floors on two elevations and then with winter coming on completed the operation with the removal of the seven 30 ft terra cotta arches that announced the theater portion of the building on two elevations. This project was the largest terra cotta recovery project in the United States.